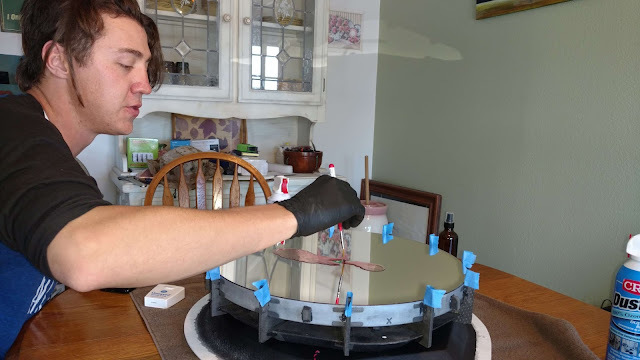 The 16" primary mirror from Insight Observatory's remote-operated Dream Astrograph imaging telescope (Astronomical Telescope for Educational Outreach) received its first cleaning. The staff at SkyPi Online Observatories (the hosting site of the remote robotic telescope) performed the cleaning using a polymer solution known as First Contact™ Polymer. This polymer solution is a one-part easy to use strip coating. It cleans and protects precision optics, telescopes, mirrors, and surfaces in use, storage, assembly and in shipping. Using this method you paint, spray, dip or pour liquid on, let it dry and peel off the flexible, strong, resilient film. First Contact™ is specially formulated to minimize surface adhesion and yet clean surfaces safely and effectively while leaving zero residues. It is an inert, non-toxic polymer system designed to remove dust, fingerprints, residues, and contaminants from delicate, sensitive, and precision surfaces such as telescope mirrors, without scratching or damaging them. SkyPi Remote Observatories Technician, Caleb Ramer, applies the polymer solution to the 16" primary mirror. First Contact Polymer™ Solutions will safely clean and protect nanostructures, precision surfaces, optics, glass, fused silica, silicon, crystals, nonlinear crystals, metals, first surface mirrors, and precision aerospace surfaces. First Contact™ Polymer also cleans and protects diffraction gratings, phase masks, and pinholes! All reflective coatings and surfaces can be safe, easily cleaned and protected with First Contact™. The fluid solution conforms to any contour, including nanostructured features, dries, and then the polymer film releases easily. This was the crew at SkyPi's first attempt using this method for mirror cleaning and as you can see from the video above, John Evelan, SkyPi Online Observatories Managing Member, can be heard commenting "It really works!". This method of mirror cleaning was also recommended by Dream Telescope's owner and manufacturer as a preferred method of mirror cleaning. This maintenance project was part of our ongoing assurance to provide optimal performance of the remote online imaging telescope.